The Renaissance or “Rebirth”, which started in Europe, was a period of renewal, revival, and growth where new ideas in arts, sciences, philosophy, and literature were developed and advanced by a few individuals. The influence of the Renaissance was far-reaching and it shaped the future, leading to a modern era. 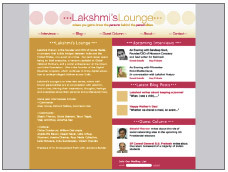 Lakshmi’s Lounge is an interview series that explores the personal journeys, aspirations and future plans of accomplished individuals who are making a difference in the world.